, Inspiration Fashion Folder: Happy 1st Anniversary! Today marks the 1st anniversary of this blog. Crazy how time flies when you keep track of it. I started the blog to collect and share the fashion musings that inspire me. I hope that I have in some way inspired you or at the very least kept you entertained. In honor of the Anniversary here are some of my favorite posts from the past year. 1. My first post, read it by clicking here! Interesting fact, this was the dress that made me fall in love with Oscar de la Renta. The image above was my screensaver at work for over a year, which is why I felt it should represent my first post. 2. 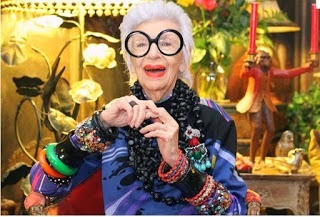 Iris Apfel - because someday I aspire to be a cool older lady! Read it here! 3. Mansaur Gavriel bags- I posted about it in August 2013 in this post, but these bags are still super hard to find. The only places to get them are to add them to a wish list here or pre-order here! 4. 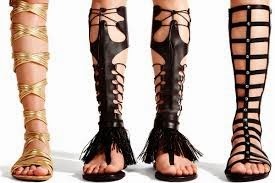 Gladiator Heels- This post from October 2013 of a photo I saw during Fashion week confirmed the idea that they would soon become a trend. In fact gladiator flats are now on my Spring Wish List (post found here). 5. Slip Dresses- Posted in October here, still and probably forever relevant. Best fashion item to come from the 90's? 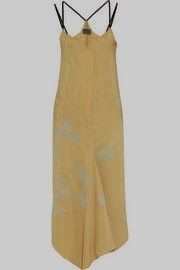 Love the Maiyet Slip Dress pictured above, but find less expensive alternatives here and here. Thanks again for reading through a few of my favorite posts from the year. What were some of yours?